Click on the book cover for more details and/or to order the book. With unexpected help from Oxford student Paul Matthews, Alyssa evades ruthless adversaries set on conquering the power within the artifact. 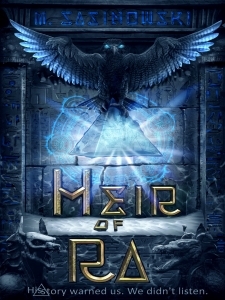 As a global epidemic looms, they must unravel deep secrets hidden within it and unveil the link between a mythical civilization and the birth of Egyptian mythology, before time runs out. Compulsively readable, M. Sasinowski’s electrifying debut thriller, Heir of Ra, is filled with action, technology, humor, and a generous dose of “what if” that just might have you question your history books.